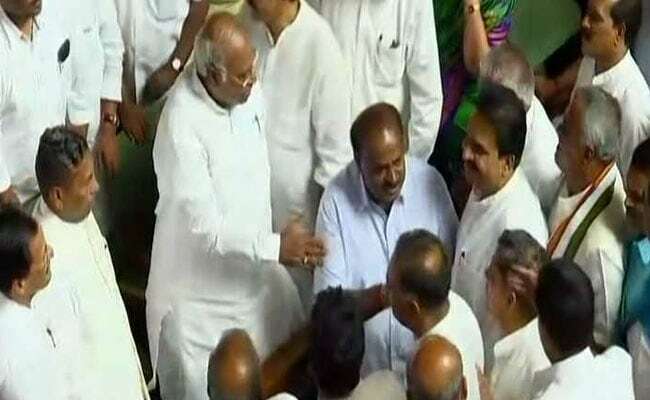 Bengaluru, Karnataka: The Janata Dal Secular (JDS)-Congress combine won a trust vote in the Karnataka assembly moments after the opposition BJP staged a dramatic walkout, throwing a dare at chief minister HD Kumaraswamy. "You have numbers...Let's see how long you last," taunted BS Yeddyurappa, leading the walkout; last Saturday, he had left just before his own floor test, accepting that he failed to make the numbers. The JDS-Congress had the support of 117 MLAs. BS Yeddyurappa, in an emotional speech, reminded Mr Kumaraswamy of his alliance with the BJP in the past and his "betrayal" - in 2006, he had refused to step down when it was time to hand over the chief minister's post to the BJP. Mr Yeddyurappa also amused the house as he confessed that his attempt to get the support of Congress and JDS lawmakers had failed as the Congress's DK Shivkumar had played "khalnayak (villain)". Before his walkout, Mr Yeddyurappa, who was chief minister for 55 hours, warned the new government of "unrest" if farmer loans not waived off by Monday. "I am not here for the power and position," Mr Kumaraswamy said ahead of the trust vote, while responding to BS Yeddyurappa's barbs. The 58-year-old JDS leader, who was sworn in on Wednesday, won the confidence motion with a voice vote. He has the support of 117 MLAs from the JD(S)-Congress-BSP coalition in the House. Just before the floor test, Congress' Ramesh Kumar was unanimously elected as the speaker after the BJP withdrew its candidate's nomination. On withdrawing its speaker candidate Suresh Kumar, Mr Yeddyurappa said, "we wanted the election to be unanimous in order to maintain dignity of the Speaker's post." Earlier in the day, there was a wobble over Congress leader and deputy chief minister G Parameshwara's comment on power-sharing formula with the JDS. He said the coalition was "yet to discuss modalities" about Mr Kumaraswamy continuing as Chief Minister for a full five year term. Mr Kumaraswamy, however, had said on weekend that there was "no rotational arrangement for chief ministership" between the two parties. Mr Yeddyurappa has predicted that the Congress-JDS alliance won't last more than three months and there are suggestions that the BJP is hoping that lawmakers left out when the Chief Minister forms his cabinet could be open to switching sides. Congress and JDS leaders, who had made Mr Kumaraswamy's swearing-in a prestige issue by inviting non-BJP leaders from across the country, dismissed the claims. "Our MLAs are intact," said Mr Parameshwara.